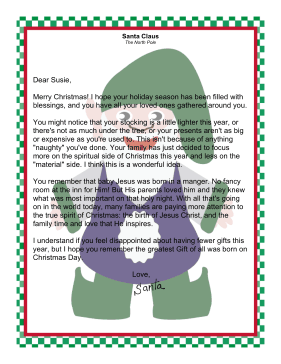 Whether a family is cutting back on gifts due to having less money, or to focus more on the spiritual side of Christmas, this letter from Santa explains that this year, there will be fewer toys and material things on Christmas morning. Merry Christmas! I hope your holiday season has been filled with blessings, and you have all your loved ones gathered around you. You might notice that your stocking is a little lighter this year, or there's not as much under the tree, or your presents aren't as big or expensive as you're used to. This isn't because of anything "naughty" you've done. Your family has just decided to focus more on the spiritual side of Christmas this year and less on the "material" side. I think this is a wonderful idea. You remember that baby Jesus was born in a manger. No fancy room at the inn for Him! But His parents loved him and they knew what was most important on that holy night. With all that's going on in the world today, many families are paying more attention to the true spirit of Christmas: the birth of Jesus Christ, and the family time and love that He inspires. I understand if you feel disappointed about having fewer gifts this year, but I hope you remember the greatest Gift of all was born on Christmas Day.